AFTER 21 years, it looks as if another brand has aced the Toyota Prius for hybrid technology. Audi's Q7 E-Tron blends diesel efficiency on the open road with an electric motor good for a claimed 56km in the city and suburbs. If your daily commute is less than that, chances are you'll be able to make it to work and back on a single charge. Audi says it takes 2.5 hours on industrial power and 10 hours on a household socket to recharge the 17.3kWh lithium-ion battery pack. If you need to venture beyond electric-car range, the diesel is good for nearly 1000km between refills. It's no bold claim, that figure is based on first-hand experience. I've just clocked up 2000km in a trip along the east cost of Australia. 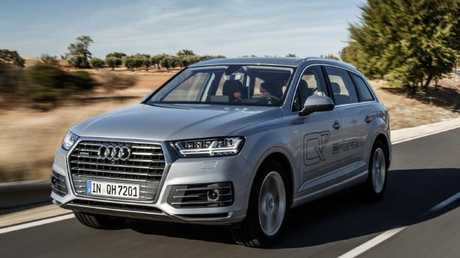 The electric-only driving range expired after just 36km, although the Q7 built up another 8km of electric-only range after several long stretches of downhill driving - ingeniously, as with most hybrid and electric cars, braking regenerates electricity. 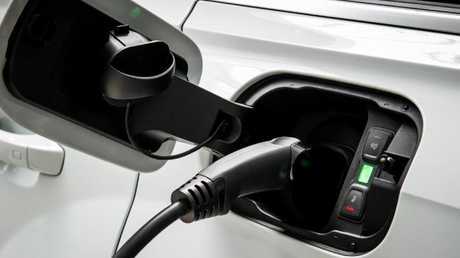 The combination of electric and diesel power is the ace up the Q7 E-Tron's sleeve. The 3.0-litre V6 turbo diesel produces 190kW/600Nm and the electric motor 94kW/350Nm. The combined output is 275kW of power and a massive 700Nm of torque. The outputs of both motors are not simply added because their peaks arrive at different points under accelerating. E-Tron over the 0-100km/h sprint in a claimed 6.2 seconds, faster than a Toyota Camry V6. The fuel rating label claims average consumption is just 1.9L/100km - because the majority of the lab test is done while the car is in electric mode. You won't get anywhere near this once the battery is depleted but, credit where it's due, we averaged a remarkable 6.7L/100km over 2000km of mostly open road driving. Quite a feat for a two-tonne vehicle. Another welcome discovery: unlike other electric cars, the brake pedal feels normal. It lacks the inconsistent bite typical of most other electric and hybrid vehicles. The changeover from electric to petrol power when accelerating is seamless, too. 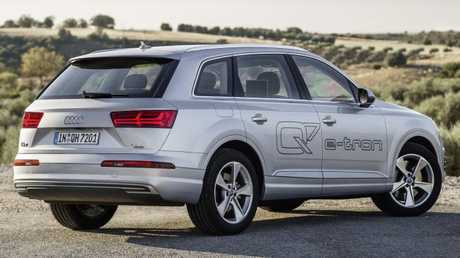 The Q7 E-Tron is a five-seater only (other Q7 variants are seven-seaters) because the hybrid hardware takes up space under the boot floor otherwise used for the third row. 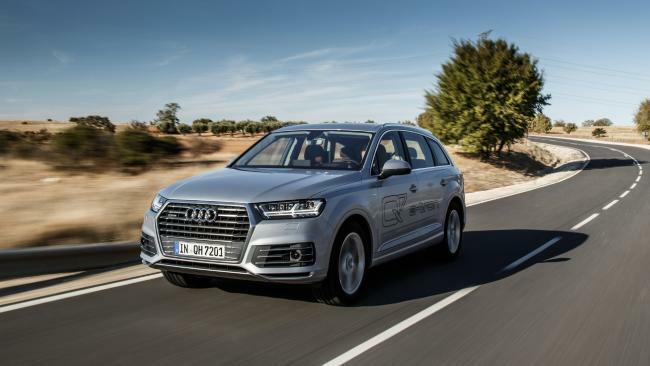 Embrace this future tech and you will be rewarded with a Q7 with the works. Audi's digital widescreen dash display is standard, as is the full suite of safety tech including automatic emergency braking with pedestrian detection, exit warning, rear cross traffic alert, blind zone warning and lane keeping assistance. Large brakes, adaptive air suspension and grippy tyres make the Q7 more agile than a vehicle this size ought to be. The taller profile tyres excel at dealing with potholes and pockmarks on Aussie back roads. Downsides? The price premium is a significant hurdle. The regular version of the Q7 3.0-litre turbo diesel starts from $97,800 plus on-road costs and steps up to $106,900 for the more powerful version. The Q7 E-Tron starts at $139,900. The $33,000 premium brings features that are optional on cheaper variants. However, it would still take more than half a century to recoup the price difference in fuel savings alone. That puts the E-Tron firmly in the early adopter category. Toyota remains the leader when it comes to putting hybrid technology in the hands of the motoring masses - but the competition is closing in. Finally, a plug-in hybrid that can cover the vast distances in Australia. PRICE Starting price is $33,000 dearer than the next cheapest Q7 diesel. The only option on the test car was metallic paint, $2250. TECH Audi's digital widescreen dash is standard, as is the full suite of safety tech including autonomous emergency braking, exit warning, lane keeping assistance, rear-cross traffic alert and more. DRIVING An electric motor provides a claimed 56km of battery range (we got 36km) before switching over to a 3.0-litre turbo diesel that's good for nearly 1000km of driving range. PERFORMANCE The combined outputs of the electric motor and diesel by far eclipse the $106,900 version of the 3.0-litre V6 (200kW/600Nm). Audi says the Q7 E-Tron does the 0-100km/h dash in 6.2 seconds, about 0.3 seconds quicker than the former, while the 4.0-litre V8 turbo diesel clocks 4.9 seconds. DESIGN The sole visual cue that this is a plug-in hybrid: there is a "fuel door" on each side, one for diesel, the other for the electrical socket. The cabin looks a little industrial but it's roomy, practical and comfortable. This version is a five-seateer only.